Helping Clients One Door At A Time! Summer is a wonderful time to spend a little quality time with friends and family; things are more relaxed, the kids are out of school and you won’t have to worry about a last minute snow storm interfering with travel plans (well here’s hoping!) . But organizing a family vacation, especially when you have young children, can be stressful (just think of the Griswalds). The packing, planning, stopping, driving, – the list could go on and on. Have you ever arrived at your destination tired, wishing you’d just stayed home? If the answer is yes, you can take the stress out of your vacation this year, and turn it into a “Staycation”! At this moment, you’re certainly considering this option, but wondering what there possibly could be to do in Ottawa for a family that already lives here? Have no fear; we have the answers you are looking for. Staycations are becoming a popular option for many families, as leaving home can be stressful, and expensive. In Ottawa, there are many options for families looking for things to do this summer during their family holidays including, but not limited to; museums, parks, festivals, Mooney’s Bay, Calypso Water Park, Saunders Farm and many more. These activities offer a change from your usual summer activities, without the stress of being far from home. Ottawa is a city that is home to many wonderful museums and exhibits just a short distance from your front door. These museums offer a wide variety of topics, from nature to history, to art galleries and more – Ottawa has a museum for every learning opportunity and interest. A more detailed list of museums and their special exhibits this summer can give you a better way to choose which museum to go to first! Don’t miss out on the brains, war history, gallery exhibits and more that will be making their way to museums in the Capital this summer. Join Saunders’ Farm this summer for an array of family activities that will fill your staycation with laughter. From challenging mazes to an expanded pedal cart race track to hayride farm tours, a splash pad, and the new jumbo jumpers, Saunders’ Farm has activities for the whole family to enjoy. With reasonable family rates, and even offering a summer camp for kids – this is a stop you don’t want to miss out on. Keep cool this summer by visiting one of the city’s many splash pads, or have a relaxing family beach day at Mooney’s Bay Park, on the Rideau Canal. As one of the city’s four supervised beaches, you can relax knowing there are lifeguards on site each day. There is a picnic area, indoor change rooms, and a children’s playground to enjoy. Hike the Hog’s Back Nature Trails, see the Rideau Locks in action, or liven up your day with an interactive Pirate Adventure in Mooney’s Bay. This live theater cruise is on a real pirate ship in the heart of Mooney’s Bay. There are over 100 splash pads in Ottawa to choose from, each with their own assortment of activities and features. Some splash pads feature water cannons, spray loops, dumping buckets and more, each with their own “cool” functionality. Make it a family mission this summer to visit as many of the 100 splash pads located across the city or find your favourite ones to enjoy this summer sunshine! 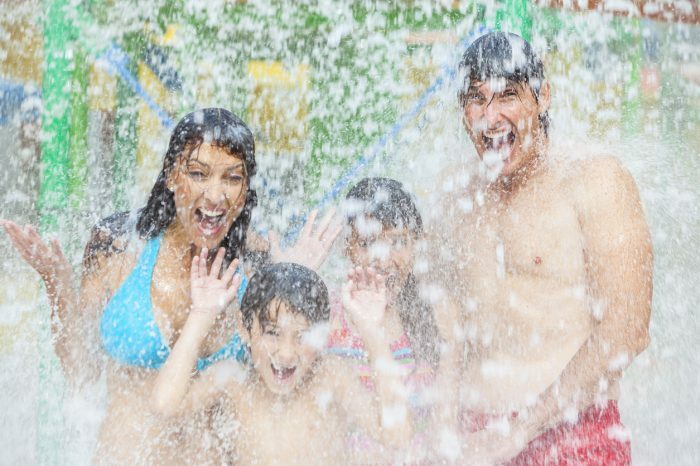 If you’re looking for something a little more thrilling than beaches or splash pads, look no further than Calypso Water Park, located here in Ottawa. Opening this year on June 6, the park features water activities for all ages. This park is home to the largest wave pool in Canada and features over 35 different water slides, two themed rivers, and 100 water games. Dive into the adventures of Calypso Water Park and keep the whole family cool and entertained this summer break. With its very own escape room, laser tag, bumper cars, jungle gyms and more – FunHaven is Ottawa’s one-stop shop for family fun. Try your hand at their rock climbing wall, or challenge your family to an epic game of laser tag. Children 0-3years enter for free, and with tons of different arcade games and activities to choose from, there’s fun for the whole family to enjoy! House of Targ is another hidden gem of Ottawa, located in Old Ottawa South just down the street from TD place. If you’re looking for a cool space with a retro vibe, this is it! Ottawa’s only true classic arcade, at House of Targ you can play over 35 pinball and classic Arcade games (yes, even PACMAN!). While you might not think of this as a “family” outing, it is very kid friendly during the day and their perogies are AMAZING. After 8pm House of Targ has some of the best live rock, punk and metal shows in the city. After all that family time you might be looking for a wee bit of “me time”. Le Nordik Spa, is located at the entrance of Gatineau Park and is one of Ottawa’s most popular “staycation” activities for millennials and baby boomers alike. Offering relaxation using techniques from the Nordic countries you can take time to unwind and re-energize in Nordic baths, waterfalls, steam baths, saunas, and more. Book a massage or body treatment and even enjoy a meal – baby you’re worth it! And it’s only 10 minutes from downtown Gatineau-Ottawa. Tour the ByWard Market this summer and see what little shops and hidden gems you can discover downtown, or take a visit to Parliament Hill to tour the Parliament Buildings. Enjoy our regal Parliament buildings, stop at museums and shops throughout the day, and celebrate the nightlife Ottawa has to offer. Check out the ByWard Market’s website to view any festivals or entertainment happening during your time and plan to visit a festival or see a show! Test your family’s skills and visit one of the many escape rooms across the city. Whether you’re looking to solve a mystery or follow the clues – see how fast you can escape! If you want to add a little extra sparkle to your staycation, try a night away from home right here in Ottawa. Book a night at the Brookstreet Hotel, Ottawa’s luxury four-diamond hotel. Offering family-rate packages, a night away from home is a piece of cake. The hotel features dining options, indoor and outdoor saltwater pool, and has complimentary kid’s activities. Check into relaxation by checking out their family rate packages. Whatever your family chooses to do this summer, take the stress out of a vacation and try your hand at a “Staycation.” Become a tourist in your city and enjoy all the family fun the beautiful Capital has to offer. With no worries about what to do with your children this summer to stay entertained, and not needing someone to watch your house and pets – you’ll certainly be less stressed! Enjoy family fun time right at home, and get a good night’s rest in your very own bed. We might be bias but Ottawa is a pretty great place to live!